The HEASARC Picture of the Week for the week for Mar 21 is titled “The Ring.” Maggie posted the same image on Blueshift on Valentine’s Day, with a caption based on a Chandra press release. It sure is a pretty picture, combining Hubble and Chandra data, with a romantic connotation. This got me thinking about the overwhelming abundance of pretty pictures among astronomical press releases. Because, to be honest, Chandra released this image to the press a few days before Valentine’s purely because it’s pretty and Valentine-ish, not because of its scientific significance. Don’t get me wrong. I have no intention of denigrating the science behind this image. However, the paper containing this image was published in the October 1, 2010 issue of the Astrophysical Journal. You don’t issue a press release about a scientific discovery, over 4 months after the paper was published. It was a pure case of seasonal eye candy. There is nothing wrong with eye candy – well, at least not with the astronomical kind. But it makes me sad if that’s all astronomy is, a source of pretty images, to the general public. More than that, I think it can be damaging to the field of astronomy. Astronomical research is never about pretty pictures. NASA didn’t spend billions of dollars on Hubble and Chandra for the artistic merits of the images these telescopes capture. Pretty pictures are by-products of astronomical research. A more common misconception may be that astronomy is a science of images, that all scientific information is derived from analyzing the images taken with various telescopes, on the ground or in orbit. That’s also untrue. We analyze the electromagnetic radiation in all sorts of ways – not only where the photons come from (imaging), but also what energies they have (spectroscopy), and when they are detected (timing). 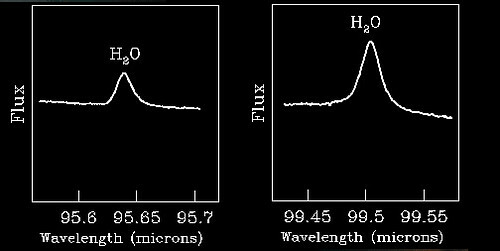 We also occasionally make use of the polarization of light (polarimetry), and we are working to launch GEMS in a few years, a satellite devoted to the polarimetry of X-rays. We also study cosmic rays (charged particles), neutrinos, and hope to study the cosmos using gravitational waves in the not-so-distant future. Spectroscopy, in particular, is arguably the most important aspect of astronomy that allows us to study the chemical composition and the motion of stars and galaxies. 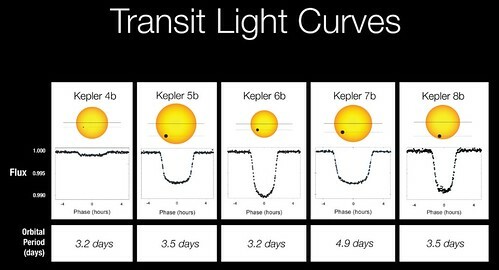 Timing has often been sidelined, but this is what the Kepler mission uses to detect planets around nearby stars. Of course, images – particularly sharp images that telescopes like Hubble and Chandra provide – are an essential tool for astronomers. 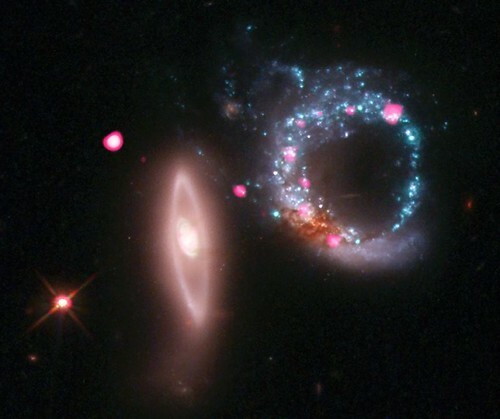 In the case of The Ring, the image unambiguously ties the class of mysterious objects called ultraluminous X-ray sources to an episode of recent (astronomically speaking) star formation. Two galaxies collided, which triggered a wave of star formation. There are now a host of black holes in binaries that are brighter than any X-ray sources in our Galaxy. It is a nice chapter (though not a complete story in itself) in our effort to unravel the mystery of ultraluminous X-ray sources. We may not know how this story ends, until we have a powerful enough telescope to be able to trace the binary motion in these ultraluminous X-ray sources, using – you guessed it – spectroscopy. I hope you, the audience of Blueshift, are interested in astronomical mysteries, and the stories of how clever scientists have solved this particular mystery or that. If you are just interested in pretty pictures – fine, we will keep providing you with more eye candy, but please remember that these are just pleasant by-products of astronomical research. This is actually a subject we at Blueshift have always been interested in. Imagery is so important for communicating science to the public, but how do we get the public to understand that there is more to science than pretty pictures? We did a summer series of podcasts in 2009 about this topic. Making Data Beautiful – in which we interviewed 2006 Nobel Laureate John Mather about the importance of imagery in communicating science and sharing data with the public. More than just “pretty pictures,” data can be used to tell a story and explain the mysteries of the cosmos. Not every piece of data would be considered a work of art, but the information contained is at the very heart of NASA science. Astronomical Data’s Long Road Home – in which we tracked data from the Fermi Gamma-ray Space Telescope along its route from the satellite to end users. Bounced between satellites, sent to Earth, processed, networked, and archived… each observation has to pass through several steps before it can be analyzed by scientists. And that’s not even considering the further effort required to make a pretty picture! The Science of Pretty Pictures – in which we interviewed Dr. Randall Smith of the Harvard-Smithsonian Center for Astrophysics, a collaborator on the Aesthetics & Astronomy project that is looking into how the public perceives multi-wavelength astronomical imagery. A team of scientists, educators, and psychologists are examining the intersection of science and art in the processing of astronomical data. I agree all the way… Unfortunately, we, the “public”, are in many cases very weak in our scientific backgound… And if one is seriously intersted in science, but have not any leading trought all the mess of information wich could be collected on the Internet, such an auto-impossed mission becomes truly time-consuming… I am not asking for more than I know it is possible… But I have the dream one day it should be a better mean to keep my self following the science pace. We have a bunch of interesting comments taking an opposing viewpoint on Facebook! Check them out! That is truly real eye candy, the coolest thing by far.